Present Music turns Schumann's Carnaval into a real circus, with help from Quasimondo theater. Present Music opened its season in September with Mozart’s Gran Partita (1781). The work paired well with another featured work – John Adam‘s Grand Pianola Music (1982). This Saturday evening, another classic work has been placed at the center of the evening – Robert Schumann‘s Carnaval (1834). So what gives? Is Present Music losing its “present” tense? Schumann’s Carnaval, once considered unplayable, has been a popular work for the virtuosic musician. 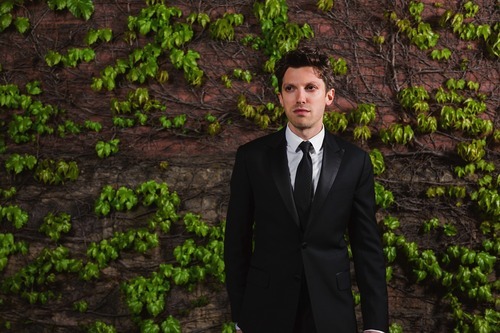 Pianist Cory Smythe, who will perform with Present Music, has shown a penchant for difficult pieces as evidenced by his masterful performance of Maurice Ravel’s Gaspard de la nuit (1908) last season. Carnaval appears in 20 short sections, with varying styles and challenging material. A “straight-up” performance of Schumann by a pianist with Smythe’s chops would be great – on some other stage. Present Music’s version will be inspired by the fact that Schumann envisioned Carnaval as a parade of characters joining a Commedia dell’arte entertainment. These traditions of Harlequin, Pierrot, Coquette and many others were well established in Schumann’s day. “All these characters had costumes, stock gestures and stage business which could be reckoned upon to create a laugh and put the audience in tune for the knavery that was to follow. In course of time there crystallized about each mask an entire code or repertory of phrases, exclamations, curses, exits, epigrammatic sayings and soliloquies appropriate to the rôle which could be memorized and made to fill in the blank when the actor’s wit could find nothing better,” as we’re told in TheaterHistory.com. The schizophrenic Schumann’s own alter egos – Eusebius and Florestan – as well as a homage to Chopin and Paganini, a mix of waltzes and reflections on women in Schumann’s life complete the parade. So Present Music has invited the unconventional, unpredictable, Quasimondo Milwaukee Physical Theatre to bring the parade to life. The audience is invited to “dress as your alter ego and play with colorful characters … for an evening of masqueraded revelry.” For costume ideas, check out this overview of Schumann’s work or this imagery of Commedia dell’arte. Or wear whatever is in the closet for Halloween. Anything can happen. That is the one constant in a Present Music event. Schumann doubled-down on a popular compositional gimmick of the day: Select letters from a meaningful word, translate as notes on the scale and develop a musical composition around that conceit. Schumann chose three four-letter combinations that identified his fiancee, the name of the town where she lived and letters from his own name as the key ideas. You can find more on this musical cryptographic exercise on Wikipedia. The somewhat accidental result has been that Schumann’s use of four-note “cells” of music can sound extraordinarily contemporary – particularly if interpreted by a contemporary performer not afraid to exaggerate these features. Smythe identifies a living Italian minimalist composer, Salvatore Sciarrino, as an appropriate point of comparison. Sciarrino’s Notturno (nocturnes) sound as though created by a composer presented with a piano as an instrument with no exposure to how others may have used it. Sciarrino explores the instrument for its percussive effects and folds together brief explosions of sound with silence. Notturno I and Notturno II can be previewed on YouTube. Smythe has taken this mix and re-imagined a performance of Schumann’s Carnaval. He previewed his intentions to a small audience at a “pre-talk” event Tuesday evening. Sections of Carnaval are rearranged or transformed. Dynamics and cellular inventions emphasized. Smyth improvises bridge segments that begin in Schumann’s world and end in Sciarrino’s. Selections from Sciarrino’s Notturnos are integrated in the composite work. Schumann might have understood what Smythe has done, but Schumann’s audiences would be baffled. Contemporary audiences will be amazed. Where does the QuasiMondo Physical Theatre fit in? Artistic Director Kevin Stalheim, Smythe and QuasiMondo will work for the first time to stitch this together Wednesday afternoon. On-stage mimes, audience engagement and occasional chaos is contemplated. Present Music’s concert will begin at 8:00 pm,, Saturday, October 24th at the Broadway Theatre Center, 158 N. Broadway. Single tickets are $15, $25, and $35. Students are ALWAYS 50% off.